This is an interview I have wanted to do for a while. Here’s somebody who is a mainstay on the 5-a-side circuit here in the UK, who has had well over ten years of seeing the game at a good level, and who was involved in one of the feel-good stories of 2014 with the Scotland minifootball squad. Let me introduce you to Jamie Leggett. Jamie Leggett, born 1985 and based in London, is somewhat of a fixture of the amateur 5-a-side scene. Like most 5-a-side players he’s tasted the 11-a-side game, specifically with Erith Town based in South East London (this season as First Team Coach) currently playing in Level 9 of the English pyramid (i.e. 8 divisions below the Premier League). Although experiencing modest success playing the 11-a-side game, Jamie has experienced significantly more success as a 5-a-side specialist over the years, most notably with now-defunct ‘Allstars’ team. Fond memories exist for the Allstars who won an impressive 10 national tournaments. I’ve heard the stories about them being a good team, and about the legendary Cable brothers (Ross & Rikki) who by all accounts beat team after team whilst seeming to argue almost non stop with each other. After they disbanded, Jamie has played a lot of football with International FC (IFC) themselves winners of multiple national titles and recently awarded ‘Grass Roots Team of the Year’ at the Globe Soccer Awards in Dubai! 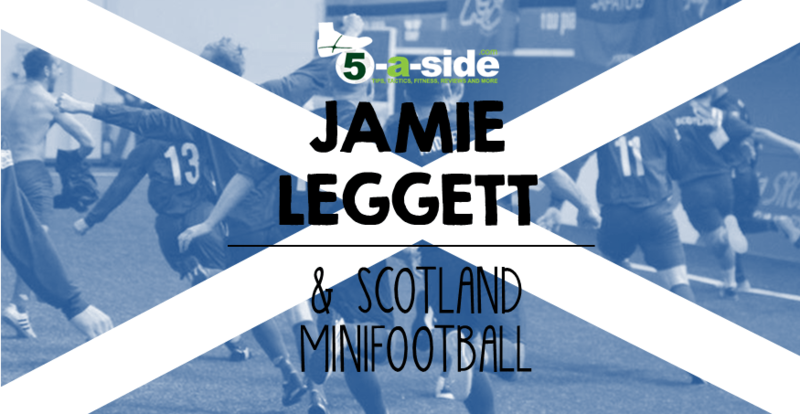 Last year, Jamie’s extensive small-sided football experience led him to get involved with the UK Minifootball Association (UKMA), initially as a scout finding the players to go out and compete in the 2014 European Championships in Montenegro. In case you don’t know, the minifootball championships are a 6-a-side format which is quite literally supposed to be a mini version of the full 11-a-side game. So the ball can go over head height, and there are throw-ins and corners when it goes out of play. Whilst working as scout, however, an opportunity arose for Jamie to become manager of the Scottish national team on an interim basis. And so, in an unexpected turn, he ventured out to Montenegro looking to try to bring a bit of tournament glory back to Scotland and in the process became involved with one of the unexpected feel-good stories of the entire championships. Whilst many of the other squads began their planning months in advance, having multiple training sessions and even playing friendly matches, preparations for Scotland were a lot more last-minute. Jamie only had a month in the position before flying out for the tournament and, being based some 300+ miles from the Scottish border, the situation wasn’t easy. There’s not a lot that can be done in that sort of time to get the squad fully prepared for the tournament, and they only managed to have three session over the year before the Minieuros together as a squad. The idea of playing friendlies wasn’t even an option for this tournament. The Selection process for Scotland was also a little different from the other home nations (England, N.Ireland and Wales). Whilst England and Wales had two or three trial days and training sessions ahead of the Minieuros, the Scottish team was simply formed from an amalgamation of two very good Scottish 5-a-side teams: ‘Atletico NWS’ and ‘TMT’ after one trial day. Both of these teams are experienced on the 5-a-side circuit, and some of the players had played in the minifootball championships in previous years. Jamie describes Atletico as having some very good young players and TMT also having some very handy players as well, particularly Joe Andrew, who went on to become the overall top scorer in the tournament, scoring nine goals. So the raw materials were there, even if the circumstances meant that the planning wasn’t. 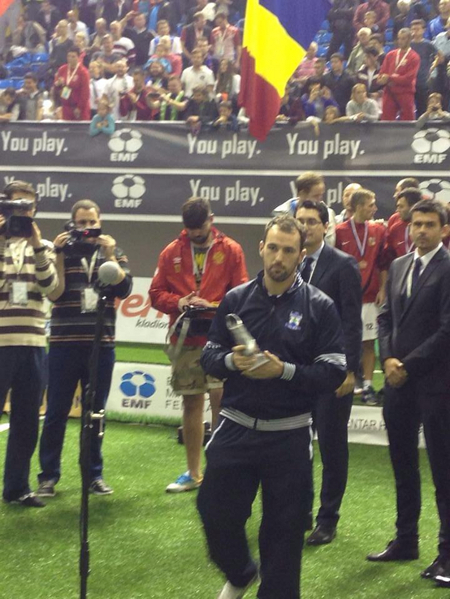 Joe Andrew receiving his golden boot award in front of the Montenegro crowd. They were drawn in a tricky group in the tournament, pitting them against hosts Montenegro, Israel (who were originally supposed to host it before political instability caused it to be relocated) and Moldova but they came through it admirably thanks largely to an epic 4-3 win in their final game against Israel. This was regarded as probably the best game of the entire tournament and even Minifootball history, helped by a sensational last-minute winner which sent Scotland not only into the next round but into euphoric celebrations at the same time! Whilst Scotland’s preparation was less than ideal, out of all of the UK nations they were perhaps the ones who should be happiest with their performance, going furthest getting out of the group stages and reaching the quarter finals before losing to eventual winners Romania. Scotland had comprehensively defied the odds. With preparation leading up to the tournament being minimal, it was a learning experience for everyone. In what little training time they had before the tournament they covered basic team shape and the style in which they wanted to play. Scotland ended up playing a 2-1-2 formation (one of the options covered in this article on 6-a-side formations) but at times without the ball they dropped back into a 3-2 shape, to deal with pressure from the opposition. A major part of their strategy was to get back behind the ball and try to frustrate the opponent. Tactically, they adapted as the tournament went on. After the second game when they were beaten by Moldova they made a decision to be more radical in their defending – either playing high pressure as a team or dropping off as a team. No half-measures. The obligatory team shot. Jamie Leggett on left side, second from bottom. In terms of the opposition, Jamie describes the successful Eastern European teams in the competition as being very good and technical, whilst employing two brutish defenders that essentially locked it all up at the back. It’s something they’ll be ready for next year. Generally across all of the matches the play was surprisingly strong and physical but the Scottish team were able to deal with this. In fact, much of their success has to be put down to the team’s impressive fitness levels, which allowed them not to have to constantly rotate substitutes, something that seems to have been a problem for some of the other teams. 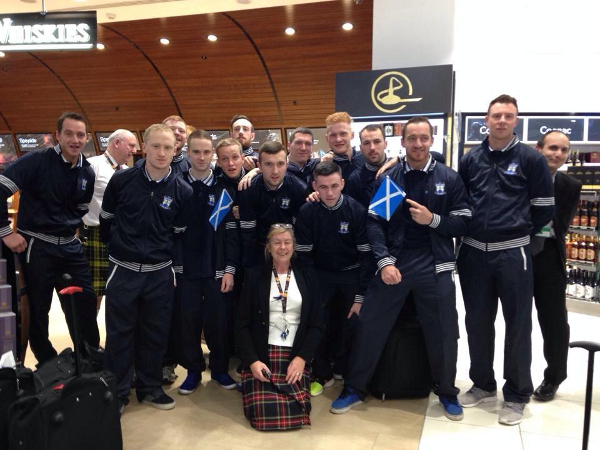 The team returned from the miniEUROs on 2nd December and immediately announced that Jamie had been given the role of Scotland manager on permanent basis. And why not, after such a good performance from the team from such minimal preparation it’s a good platform to build on for next year. Jamie, just to be clear, isn’t Scottish so I wondered if it all seemed a little strange working with a team that isn’t his home nation. Actually, he said he’s very happy to be in this role in 2015. Something special went on with the Scotland team out in Montenegro as you can probably tell from this video of them celebrating. Why would he not want to be part of that? 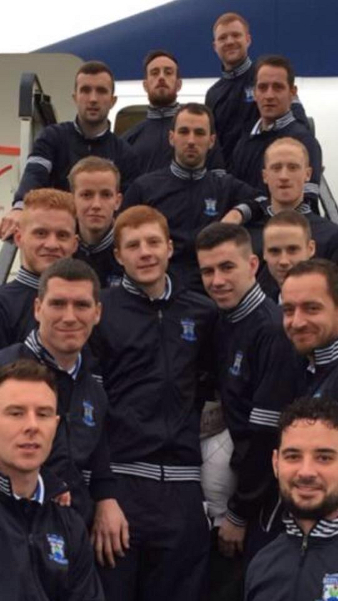 2015 will be a new challenge for Jamie and the Scotland boys. Adding to all of his considerable small-sided football experience, having now tasted the European Minifootball championships puts him in a position where he’s determined to use all of this additional knowledge to make sure that they’re again competitive at next year’s tournament. This time, there will be proper preparation for the tournament, including training camps and friendlies against other nations. Considering what Scotland did on much less preparation last year, if they can keep the same spirit and work-ethic together and maybe add a couple of new lads who share that vision, next year they might just be able to go a little further. That would certainly give Jamie and the Scotland boys much bigger cause for celebration! As well as that, he’ll no doubt be back out on the 5-a-side circuit himself. And by the way, he’ll still be scouting for the UKMA in 2015 (he’s worth a follow on twitter @JamieLeggett1 if you want to get in touch about how you can trial for the teams). The sort of attitude with which Jamie plays the game himself, fully committed at all times. Good luck to you and the Scotland boys this year, Jamie. Look forward to catching up again in the future. With thanks to Jamie and UKMA for the photos used in this article. You can check out the UKMA here.